Hello! The post is very good and your blog also is very good. That is why we invite you to join the service LinkFromBlog.com – the place where you earn money just for writing in your blog. Visit the site and find more detailed information there. Make your blog work for you – it is very simple! Good luck. apik mbak, pengen ngonpret neng theme wp jane, tapi piye ya...??? css'e langsung dikopas kenek ra ya? Hi - I love this layout, but is there a way to remove the tweetmeme button from posts? @anonym: open edit html, expand widget template, delete tweememe code , just search for "tweetmeme"
I love this template, but I've just spent the last 3 hours trying to tweak it to my use and still cannot figure out how to get the posts to show up properly. Everything else, I've basically figured out, but this last thing is driving me CRAZY! Macam mana ya? tak tau lah nak ambik templet ne..boleh email kat aku tak html templet ne dr a-z..
Great template however on the homepage the images in the posts look streched and the text runs out over the 'read more' link.. I like this very much... Thank You! nice template.. i like it..
i want to use it also..
but could you help me change "subscribe here" banner [above post comment] to ad banner..
i need a html code with instruction.. please.. I have being using Bemagazine for about 2 months and made lots of small changes it's a seriously good template ! I love this template, but the home - previous and newer links aren't at the bottom of the posts. They are stuck between the body and sidebar. Those little black dots are the previous - home and newer post links. I thought downloading a clean BeMagazine template would clear it up but it's happening to all BeMagazine templates. Is there a fix? Hi, your template is GREATE! How did they change this template? Thank you. I love this blog templete. i have a new blog comming up. i will use this template i like it. can you tell me how to add a third column? Great theme, but I can only get 12 posts to show up on the main page?! Hi!! This template is amazing! But I have the problem of the "newest entries - older entries - home" problem... it's stuck behind the posts. How I can fix it??? Thanks in advance and congrats for your amazing work. Great template however on the homepage the images in the posts look streched ! 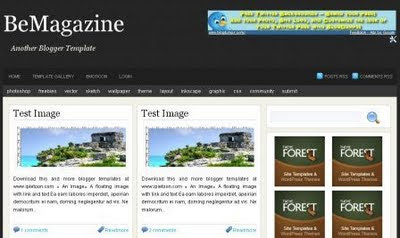 Be Magazine is very nice and more interesting so that can be enjoy it in this magazine. Mostly people are very like it. Good Magazine shared on the site because in this Magazine is very nice and enjoyable so that can be enjoy it in this Magazine.